Rugged "Duck" G-10 series, the virtually indestructible synthetic handles of these knives have been crafted to reflect the well-known Carhartt Brown Duck fabric and are suitable for the harshest conditions. The blades of these knives feature strong shoulder and satin finish, brushed finish Lazy Duck bolster, G-10 handles and brass finish Carhartt shield. Case artisans still hand-craft each knife the way they have for 124 years. They put a lot of time and effort into making sure the knives they produce today reflect on their history in positive way - the finest steel blades, nickel silver bolsters, covers that are pinned, not glued like lesser grade knives, and a limited lifetime warranty. All this and the pride of being made exclusively in the USA stands behind each knife. 3 5/8 in / 9.84cm closed; 2.5 oz. Working Line Medium Stockman Rugged "Duck" G-10 series, the virtually indestructible synthetic handles of these knives have been crafted to reflect the well-known Carhartt Brown Duck fabric and are suitable for the harshest conditions. 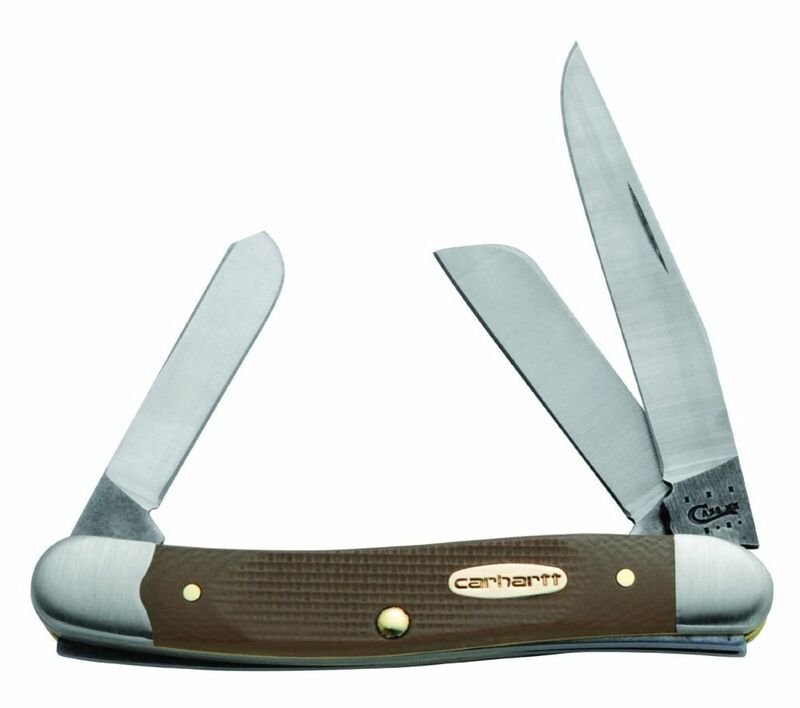 The blades of these knives feature strong shoulder and satin finish, brushed finish Lazy Duck bolster, G-10 handles and brass finish Carhartt shield. Case artisans still hand-craft each knife the way they have for 124 years. They put a lot of time and effort into making sure the knives they produce today reflect on their history in positive way - the finest steel blades, nickel silver bolsters, covers that are pinned, not glued like lesser grade knives, and a limited lifetime warranty. All this and the pride of being made exclusively in the USA stands behind each knife.